Tragedy struck the family of Helen Monk when she died of breast cancer last year aged just 48. But it prompted members of the Wayland Lodge to remember her by donating money to the Macmillan Unit at the West Suffolk Hospital, in Bury St Edmunds, where she was cared for in her final days. The freemasons raised an incredible £2,500 over the course of the year from a variety of events. They included race nights, a ladies’ festival, coffee mornings and raffles. They also donated 800 hand-knitted baby hats and 200 pairs of comfort triangles for new born babies and their mums to both the West Suffolk and the Norfolk and Norwich Hospital. 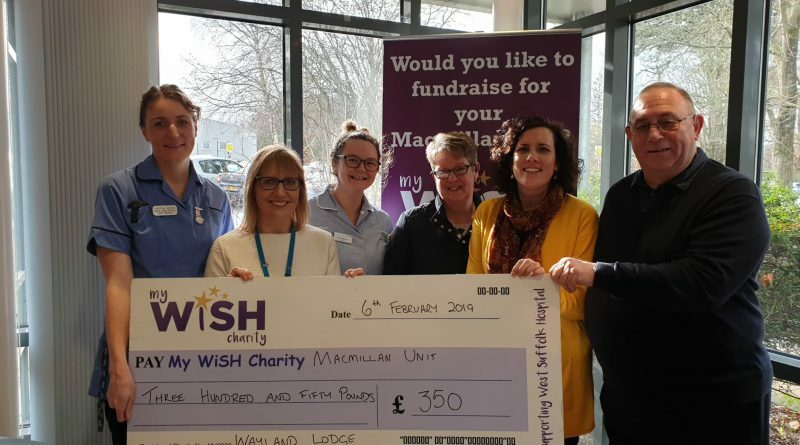 The total amount of money was split between five charities with My WiSH receiving £350 which has gone to the Macmillan Unit and was handed over to staff and the charity’s appeal manager Sally Daniels. The lodge, which is based in Watton and meets eight times a year on the fourth Tuesday of the month, has up to 40 members and its Worshipful Master Alan Ryan explained that they chose the specialist unit for the amazing care given to Mrs Monk who was his sister-in-law. She lived in Brandon and was diagnosed with the illness in June last year before losing her fight for life in August. He said: “My wife Sue lost her sister on August 11 and we wanted to do something to help repay what the nurses and medical staff do. They just give above and beyond what is expected of them and the money will be used to help to care for the patients on the unit. Pictured at the cheque presentation at the West Suffolk Hospital is Christine Watkins, acute oncology specialist nurse; Nicky Mckee, Macmillan information services; Kimberly Alderson, staff nurse), Sue Ryan, Sally Daniels and Alan Ryan.